The coolest free knitting hat patterns. Easy to follow instructions for making any size knit hats and knit scarves for any occasion. Toy hat patterns you can adjust to make any kind of sock monkey hat you can think of. 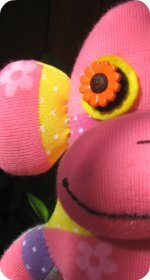 The basic roll brim sock monkey hat pattern is easy to adjust to make many styles of toy hats. The pattern can easily be altered to make any size hat, for toys, kids and adults. 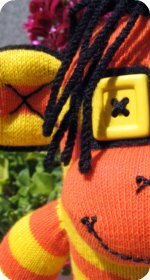 Rasta colors sock monkey hat : How to knit a roll brim reggae hat using Rasta colors. Make a sock toy hat or Rastafarian hats for kids and adults. Basic roll brim hat : Free knitting hat patterns for a funky red (or any color) roll brim hat. These easy to knit wool hats are great for a beginner knitter. 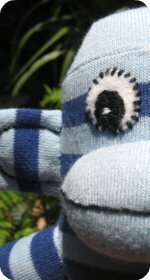 Check out our sock monkey hat pictures page where you can see photos of each of the sock monkey hats that have been created. 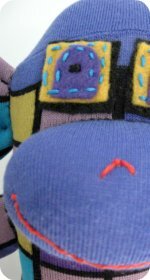 The tall roll brim hat patterns were created to decorate my sock monkey dolls in holiday attire. To keep it simple I just started off with the basic roll brim hat pattern and kept on knitting. Now you can make all sorts of crazy tall hats. Roll brim hats are featured because the original sock monkeys that were made with the vintage sock monkey pattern, crafted a hat made from the toe of one of the Red Heel socks. This was done by cutting off the toe of the sock, leaving ½ inch of brown to roll for a brim. So I thought it was fitting to knit sock monkey hats with a roll brim. 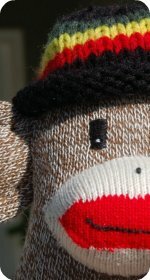 If you are wanting a make a hat with a sock monkey face on it knitty.com has a fun hand knit hat pattern. 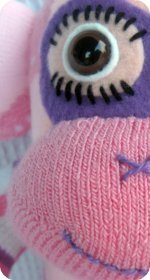 "How to make the original red heel sock monkey and other toys" has a large selection of sock monkey and sock doll clothing. There are diagrams and easy to follow instructions on how to make a: tam, coolie, top hat, brim hat, cone hat, Robin Hood hat, dutch bonnet, pixie hat, soldiers hat, engineers hat, sombrero, cowboy hat, Indian headdress, Red Riding Hood cloak, Santa Claus cap and a clown hat. There are instructions on how to make the original red heel sock monkey and other toys, over 50 different toys infact. Toy patterns include elephants, bears, ponies, cats, dogs, kangaroos, octopus, dolls- even Santa Claus.